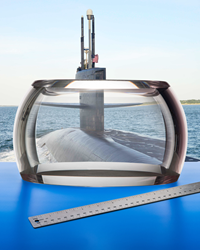 Meller Optics' Optical Sapphire Hyper-Hemispheric 360 Degree Window is a multi-spectral head window designed to permit total panoramic submarine mast imaging on Virginia and SSGN class submarines. A new truncated hyper-hemisphere 360 degree window made from sapphire to provide transmission from the UV to IR and SWIR while withstanding harsh environments. These multi-spectral head windows can be fabricated in sizes from 6” to 12” O.D. with varying wall thicknesses, depending upon the outside diameter. Meller Optics, Inc. has introduced a new truncated hyper-hemisphere 360 degree window made from sapphire to provide transmission from the UV to IR and SWIR while withstanding harsh environments. The Meller Sapphire Hyper-Hemispheric 360 Degree Window is a multi-spectral head window designed to permit total panoramic submarine mast imaging on Virginia and SSGN class submarines. Featuring an enhanced 65 degree field-of-view with 99% transmission from the UV to IR and SWIR when A/R coated on two sides (85% uncoated), they can be fabricated in sizes from 6” to 12” O.D. with varying wall thicknesses, depending upon the outside diameter. Providing Mohs 9 hardness which is second only to diamond, Meller’s Sapphire Hyper-Hemispheric 360 Degree Window has a 40-20 scratch-dig surface finish, 10 Angstrom surface roughness, with a surface figure of 1.0 fringe over any 2.0” dia. on both faces. This sapphire head window was originally developed by Meller for the U.S. Navy for their affordable modular panoramic photonics mast program (AMPPM) for a non-rotating mast structure. The Meller Sapphire Hyper-Hemispheric 360 Degree Windows, domes and similar products are priced according to size and quantity.